Now that such high quality digital copies of historic photographs are possible, people sometimes question why preserving the original matters. There are actually many reasons that can be given to justify this core business at the Hocken but this blog post will just touch on a few in relation to one specific item, P2014-001, in the Photographs Collection. What would prove the annual highlight of donations for 2014 arrived just after New Year, when a lady walked in holding an old Christmas card box containing a family heirloom. Mrs Joan Miskimmin had been given the contents by her father, P.D.J. Cockerill, and decided to gift it to the Hocken for safekeeping. 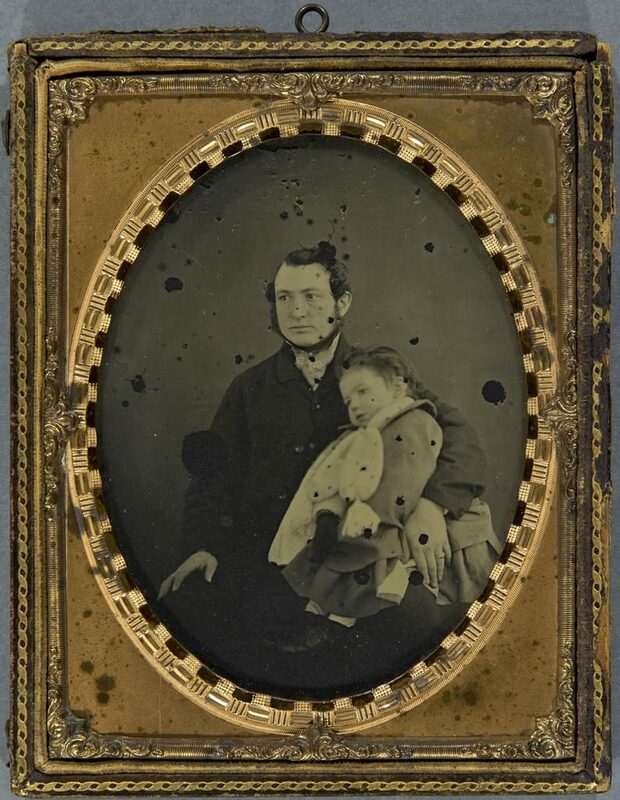 Once the photograph had been carefully removed from the wrapping and traces of red glitter blown away, the portrait of a young man with a small child on his knee looked familiar. 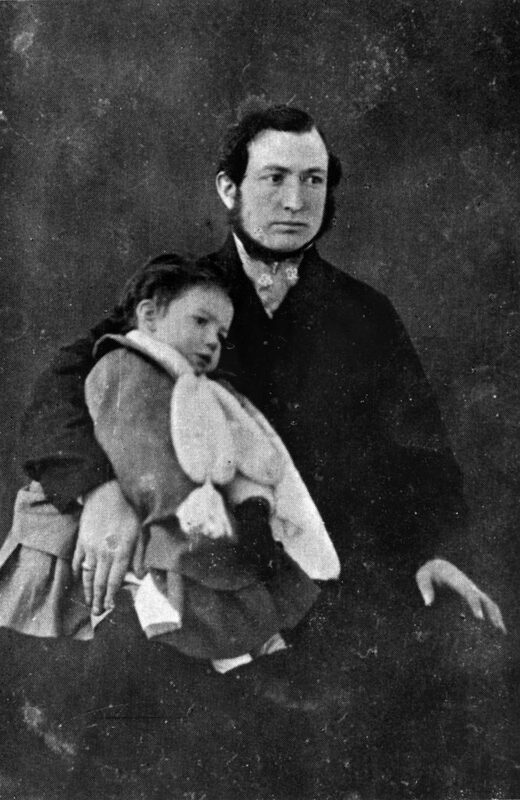 The Hocken already had a copy print of the photograph on file and the image had been published over the years in a number of books, always identified as the well-known whaler and pioneer Dunedin businessman, John Jones. The donor knew by then, however, that this information was incorrect. Fig. 1 John Jones, copy print, S11-315. Thanks to maritime historian Ian Farquhar, someone had thought to question this attribution and hunted down the original. John Jones was born in 1808 or 1809, married Sarah Sizemore in 1828 and together they had eleven children. This would have made John in his early 30s when Daguerre first patented the daguerreotype and Talbot developed the calotype process in 1840. 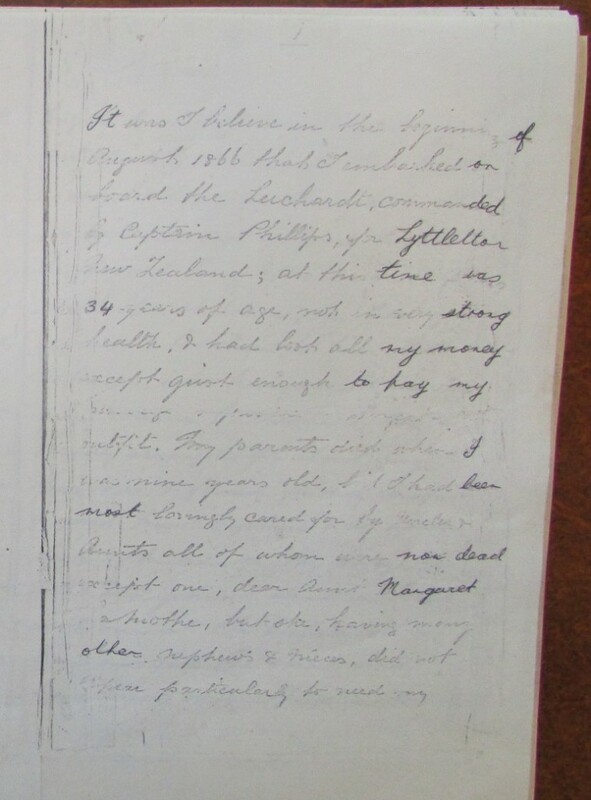 Though it is often difficult to define people’s age, things didn’t seem to quite add up so Ian invited Associate Professor Erika Wolf from the University of Otago to accompany him to the owner’s home and advise on the probable date by looking at the photograph itself. Fortunately, the history of photography encompasses the rapid development and use of many different materials and technical processes and using her knowledge, Erika could quickly determine the portrait as an ambrotype. Ambrotypes belong to the small category employing non-paper supports and are photographs on glass as opposed to daguerreotypes on polished metal, ferrotypes (commonly known as tintypes) on lacquered iron, and opaltypes on translucent white glass. Like daguerreotypes, ambrotypes were often put into elaborate pinchpeck frames and cased for protection but can still be easily told apart when looking at the original by the fact that daguerreotypes have a mirrored appearance, turning from positive to negative when viewed from different angles. 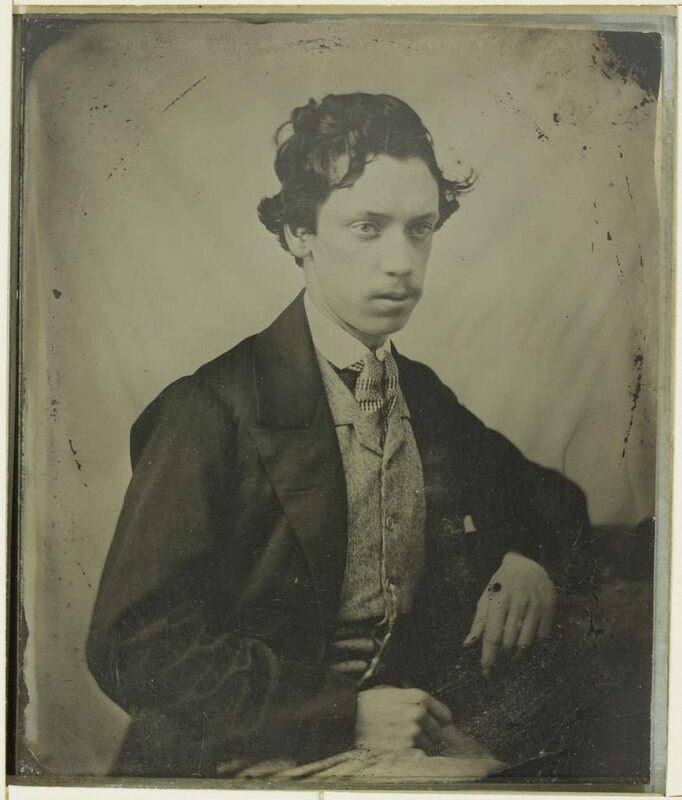 Ambrotypes became popular around the world in the 1850s, so even though there is nothing on the artefact to say whether or not it was produced in New Zealand, enough information could be gleaned by looking at the original to rule out the initial identification. The portrait is now thought to be of John Jones’s eldest son, John Richard Jones (1832-1911), and his eldest daughter, Mary Louise Sarah, who was born in August 1856. Fig. 2 John Richard Jones and Mary Louise Sarah, ambrotype, c.1858. Hocken Photographs Collection, P2014-001. The Hocken Photographs Collection includes examples of all the early forms of nineteenth century photography. Every year, classes of students at the University of Otago and Otago Polytechnic come to visit and learn to discern the differences by looking at the originals, Hocken staff routinely use this knowledge to help catalogue items and members of the public, including artists and photographers, request to see the real objects which have survived the years and can only be fully appreciated at first hand. A small selection of early photographs on non-paper supports are shown below. Fig. 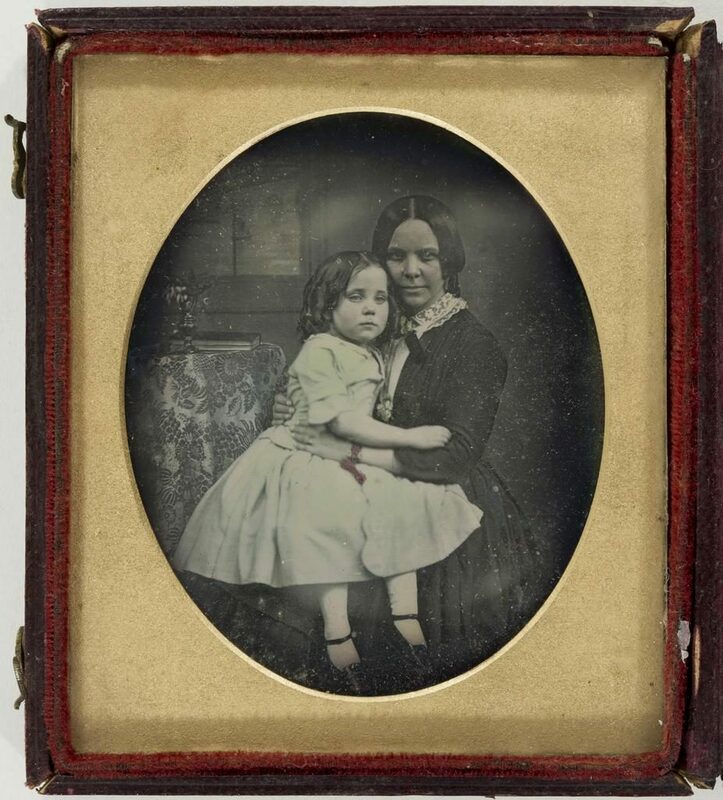 3 Mother and daughter, hand-tinted daguerreotype, Whitelaw family collection, 1840-1850s. Hocken Photographs Collection, P1997-120-001. Fig. 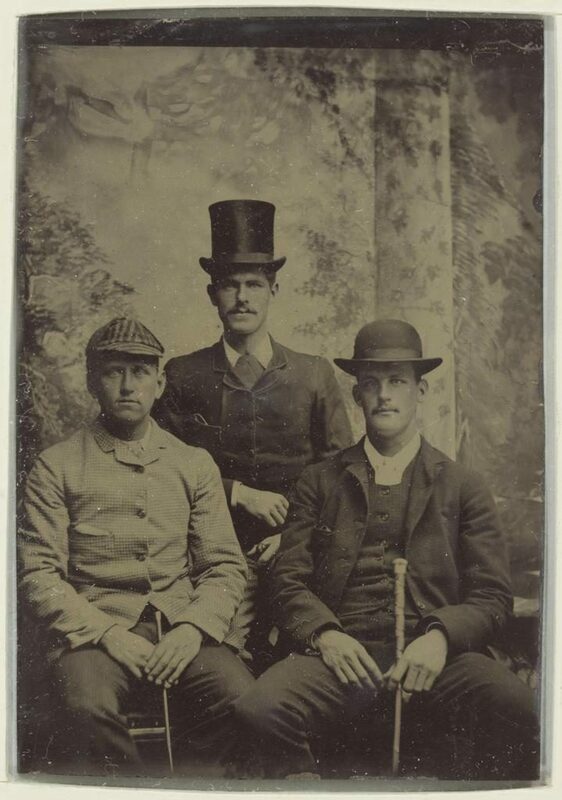 5 Three young men, ferrotype, Whitelaw family collection, 1860s-1870s. Hocken Photographs collection, P1997-120-002. (According to historian Bill Dacker, hats were quite a feature of society in Lawrence around this time). 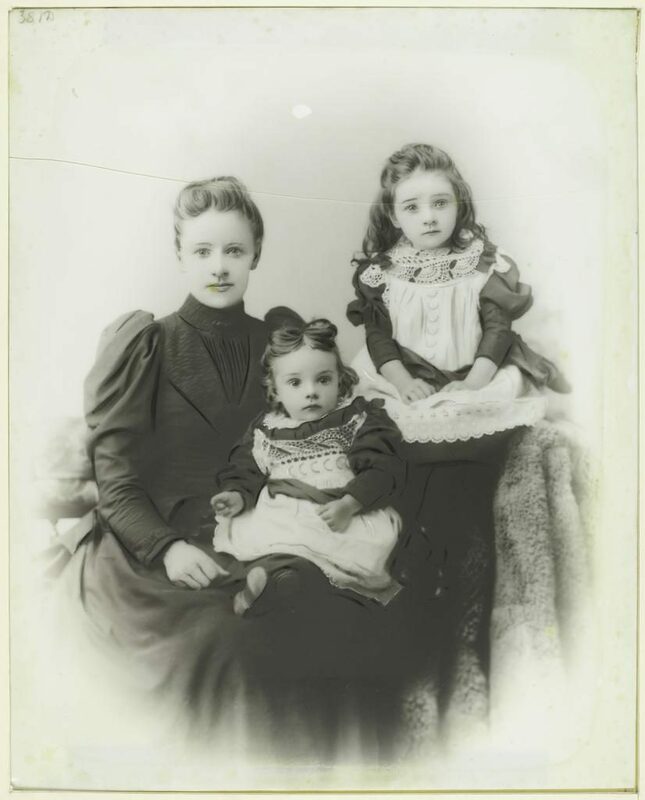 Post researched and written by Debbie Gale, Arrangement and Description Archivist. 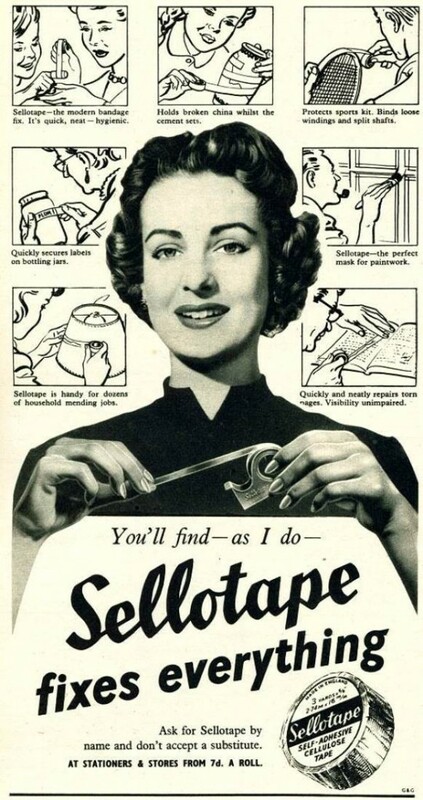 Since its introduction in the 1930s, sellotape has been popular for attaching and mending paper and other material. It is a common sight in archives to see first-hand just how much harm this ‘quick fix’ can do in the long term. 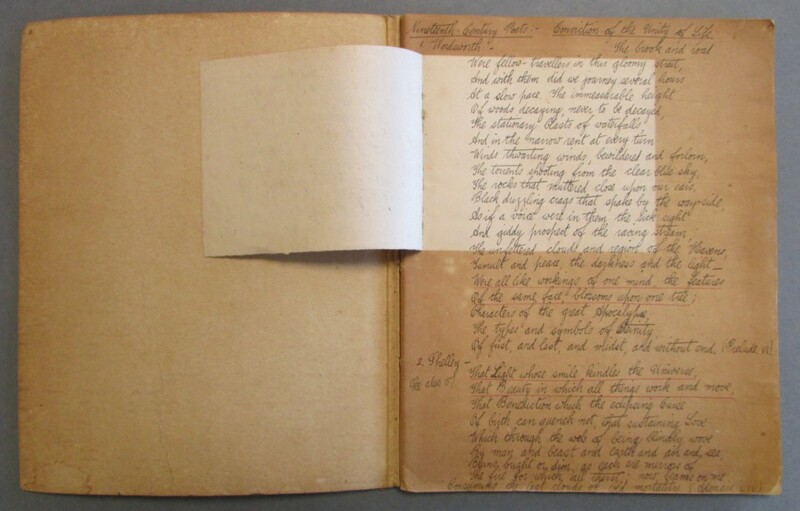 As is apparent, rips and tears on the first page have been repaired with sticky tape and its lasting effects are neither successful nor aesthetic. 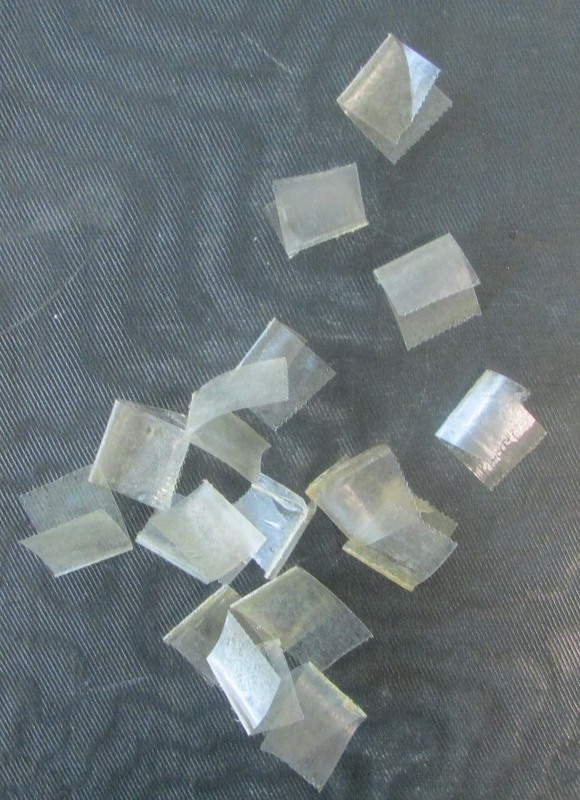 It is a perfect example of how the compounds comprising sellotape and paper have interacted with each other over time. Sellotape is comprised of a clear film on top, called the carrier, which is traditionally cellophane. Cellophane is regenerated cellulose. The bottom layer, the sticky part, is traditionally rubber-based adhesive, made so that it bonds with what it touches when pressure is applied. The rubber adhesive is a long polymer chain, just like the cellulose that makes up paper. Over time, as the paper and the adhesive stay stuck together the two types of polymers will begin to interact and attach to each other in a process called ‘cross-linking’. It is clear from the photocopy of these memoirs produced in the 1970s, that the sticky tape repair work had been undertaken before that time. It is interesting to note just how the condition of the original memoirs has continued to deteriorate since then. It was in a far better condition in the 1970s than it is in the present day. Ergener, Sibel (2012) Sellotape: Why it’s bad to put on paper, and removal [online]. [Accessed 10th February 2016]. 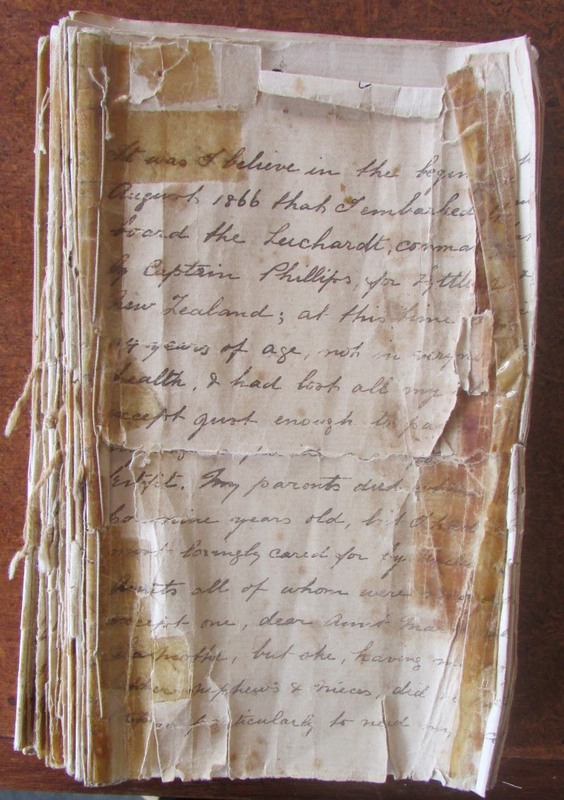 We often see the effects of acidification of paper on archival collections. Here is a particularly graphic example found in an old school notebook from the papers of the economist Allan George Barnard Fisher (1895-1976). The cover of the volume is acidic board, and over the years the acid has migrated from the cover to the first page. 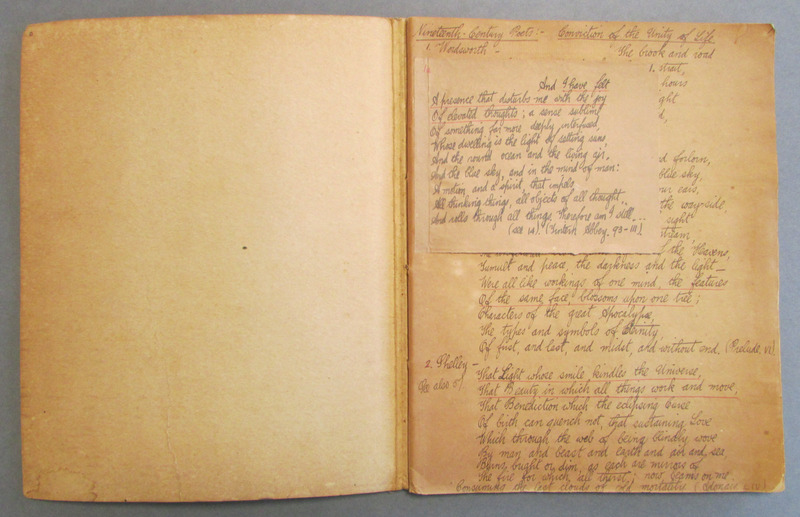 A note inserted over part of the page has slowed the acid migration in that area, causing the paper underneath to be less damaged and lighter in colour. The subsequent pages in the volume have remained lighter. From the late 19th century most paper was made from wood pulp. Wood pulp paper has what conservators call “inherent vice” and most will degrade over time becoming more brown and brittle. We now frequently see 20th century papers that are in much more discoloured and fragile condition compared to papers from the 19th century. Earlier papers were usually made from cotton fibres which do not age in the same way. Acidification of paper happens when lignin (a fibrous component of wood) breaks down over time. As the lignin breaks down acids are produced that weaken the cellulose fibres of the paper, and make it yellow or brown and brittle. Like many chemical reactions, the acidification process is speeded up by heat, humidity and light. Leave a fresh newspaper outside in a sunny spot for a few days and see the effect of the sun, dew and daytime warmth for yourself! 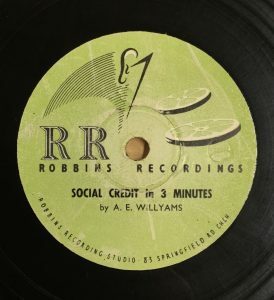 Because of the almost universal use of wood pulp based papers across the world for much of the 20th century we are often presented with preservation conundrums like the A.G.B. Fisher volume pictured above. 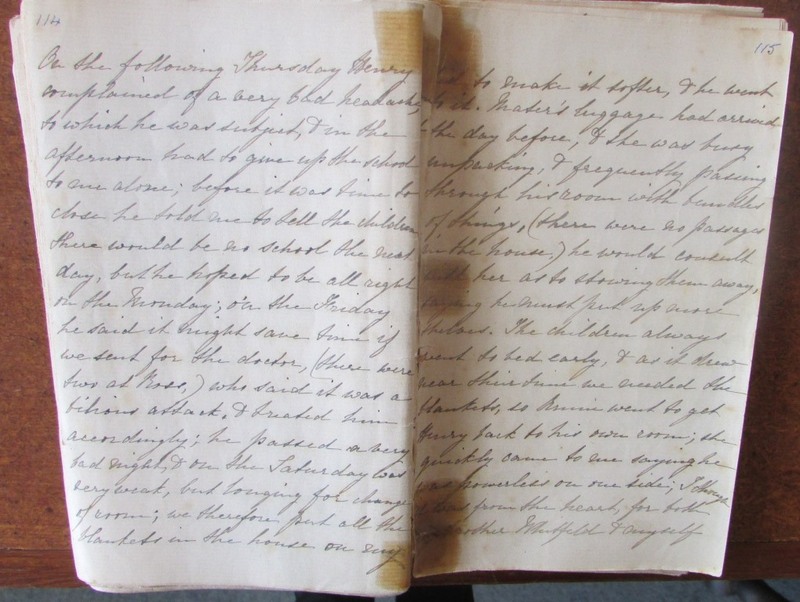 The staining could be removed by a professional conservator but the paper will remain weak and conservation treatment is expensive so we rarely have archives treated for this kind of damage. Our strategies for preserving paper are to improve storage conditions and reduce physical handling. The conditions we store the collections in at the Hocken help slow the rate of deterioration. Air conditioning systems ensure the air in the storage areas remains at a constant temperature and humidity and dust is filtered from the air. Light is excluded by packaging in sturdy acid free folders and boxes, and lights are only turned on when staff need to work in the storage areas. The folders and boxes also provide physical protection to brittle paper, preventing bumps and tears caused by handling. At home you can help slow the deterioration of your books and family papers by storing them out of direct sunlight, in a dry and clean place. Garages, sheds and basements are not good places for storing older historical material as they tend to be damp, dusty and light and temperature is uncontrolled. Put historical papers and photos in clean new file folders and boxes. Don’t attempt repairs to tears with any kind of sticky tape, don’t have documents laminated as this causes irreversible damage. Don’t put book cases directly against outside walls, leave a gap for air circulation between the book case and the wall or preferably put the book case against an internal wall. 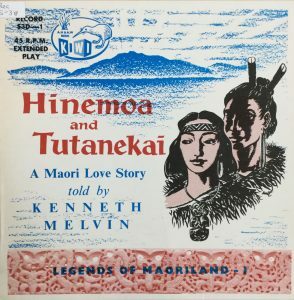 The National Preservation Office at the National Library of NZ provides more detailed advice on the care of collections from their website.